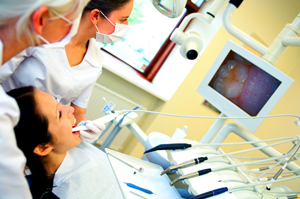 Modern cosmetic dentistry has solutions for virtually all your cosmetic dental problems. A combination of advanced tools, sophisticated materials, and innovative techniques allow people to correct numerous cosmetic dental problems that in the past were considered untreatable or only poorly treatable. Whether you have discolored teeth, missing teeth, or any cosmetic problem in between, we can help you find not one, but in many cases many possible solutions. This page contains basic information about common cosmetic dental problems and their possible solutions, but the only way to determine which solutions will work best for you is through a personal consultation. To schedule a consultation at our Denver cosmetic dentist office, please contact Ascent Dental today. Modern cosmetic dentistry offers us multiple solutions to all these problems. Discolored teeth can be easily corrected using tooth whitening. Tooth whitening can remove stains to your teeth, rolling back years on the appearance of your smile. If, however, the whitening you can achieve is limited by the inherent color or thickness of your dental enamel, then you may get better whitening results from porcelain veneers, especially if you have other cosmetic dental problems you want to correct. Chipped teeth can be restored in one visit using dental bonding. Cosmetic dentist Dr. Jeff Johnston has a deft hand for modeling natural tooth shape in bonding material to give you natural-looking results. For a more permanent and even more attractive appearance, porcelain veneers may be recommended. Teeth with metal fillings can be made more attractive when the discolored metal fillings are removed and more attractive porcelain inlays or onlays are used instead. Sometimes, your tooth may have too much filling to maintain its structural integrity, and a dental crown may be recommended instead. Crooked or gapped teeth can be improved using Six month smiles. This cosmetic dentistry solution uses the proven technology of traditional braces in an innovative way to get faster, more reliable results than so-called invisible aligners. Porcelain veneers are another option if you want even faster treatment that also corrects discolored, chipped, or misshapen teeth. Dental bonding offers the fastest, least expensive treatment for gapped teeth, but may not be appropriate in all cases. Short, worn, or cracked teeth can be built up using either porcelain veneers or dental crowns depending on the amount of structural damage your teeth may have sustained. Using our advanced technology CEREC machine, you can even get your crowns in a day. Missing teeth can now be replaced with dental implants. This advanced technology replaces your teeth with artificial teeth that require no special care, allow you to eat all your favorite foods, and with proper care can be lifetime restorations, though the crowns atop the implants may need replacing. Dental bridges are another tooth replacement options, along with advanced dentures. At Ascent Dental, cosmetic dentist Dr. Jeff Johnston uses his training, experience, and professional judgment to recommend the right cosmetic dentistry treatment to achieve the results you desire. And we stand by our work with a guarantee on every dental restoration we place. We strive to keep costs reasonable, are in-network for most local dental plans, and offer financing for treatments not covered. In addition, our comfortable office is centrally located in Cherry Creek and our compassionate staff works hard to ensure you have the best possible dental experience possible. To learn more about the dental solutions we offer, please schedule a consultation with Cherry Creek cosmetic dentist Dr. Jeff today.